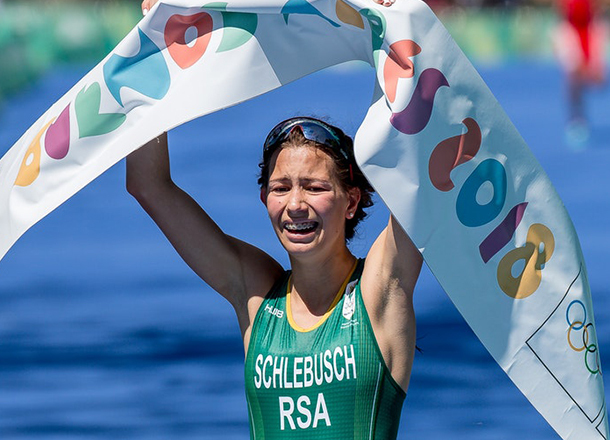 It was a day to savour as young Durban triathlete Amber Schlebusch crossed the line first and claimed the gold medal in the women’s triathlon event at the Youth Olympic Games in Buenos Aires on Sunday. The 17 year-old from Durban Girls College, who is a member of the Elite Athlete Development Programme, went into the event with realistic expectations in a field that included the best junior triathletes in the world. “I was hoping to get a top ten and that is what I kept telling people that asked me,” the KZN Junior Sportswoman of the Year said. “But secretly, to myself I was hoping that I could get on the podium. “I never thought that I could win the event but I was hoping to get into the top three! The race wasn’t as straight-forward as Schlebusch would have wanted it to be and she had to fight back on a number of occasions to get herself into a position where she could win. She had a dominant run where she set the fastest time by ten seconds. “I started my swim well and got to the first turn in a good position but then I think I just lacked the endurance and finished one or two spots behind the leading girls. “My first transition was shocking! It is something that I really need to work on but I managed to stay in touch. “I think on the run I surprised a lot of the spectators because the run was on a loop so they didn’t see us much and I managed to catch the leader in the last five hundred metres to win! “The feeling I experienced is hard to describe! There was so much emotion – I think I had a little cry,” she laughed. Schlebusch’s duty at the Youth Olympics is not over as she gears up for the Mixed Triathlon relay where she joins fellow South African Christiaan Stroebel along with Tunisian athletes Mohamed Aziz Sebai and Syrine Fattoum to represent Africa. With a major milestone reached, the young star is hoping to continue her growth as an athlete both on the circuit and away from it. “I am really motivated to work hard when I get back home,” she said positively. “I want to get faster and faster and use the team at Prime to help me build my strength – I think that is an area I can improve.